Candida infections of the oral cavity are relatively common and may present in several forms. Any of the forms may be asymptomatic or may cause soreness and burning. The most common, acute pseudomembranous candidiasis, or oral thrush, presents with multiple white patches on the tongue, palate, and other areas of oral mucosa. These lesions may be easily removed by scraping with a tongue blade to reveal an erythematous, irritated mucosa (Box 1). In addition to oral thrush, oral Candida infection occurs in several distinct forms. Acute atrophic candidiasis causes erythematous mucosa found typically on the palate and tongue, chronic atrophic candidiasis results in erythema and edema of the mucosa of denture wearers who do not practice adequate hygiene, and angular cheilitis causes erythema and fissuring of the corners of the mouth. Finally, Candida leukoplakia is described as adherent white nodules on an erythematous base and often does not respond to topical therapy. This condition also carries an increased risk of malignant transformation. Budding yeast and hyphae may be seen on a KOH preparation or on preparations made with para-aminosalicyclic acid (PAS) stain, Giemsa stain, or Gram stain. Culture of oral scrapings may grow Candida species, although this is not a specific test. 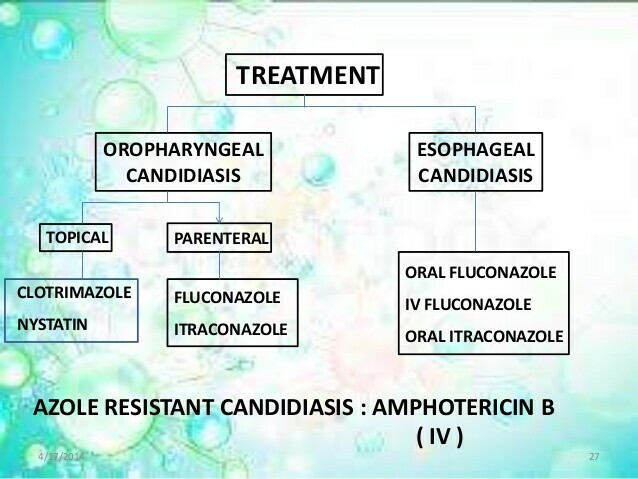 Oral candidiasis must be differentiated from bacterial and viral infection as well as malignancy. While uncomfortable for those affected, it is unclear if oral candidiasis predisposes to Candida infection at other sites. There are reports that Candida esophagitis may follow oral thrush, although esophagitis was not excluded at the initial presentation in these reports. In those with oral infection and infection at a second site, it is likely that immune system deficits allow for multiple infections rather than spreading from the oral cavity. The diagnosis of oral Candida infection may be suspected when the characteristic appearance of the mucosa is present and, in the case of oral thrush, when scraping of the mucosa removes the white plaque and leaves an inflamed mucosa. Demonstration of dimorphic fungi on KOH-, Giemsa-, Gram-, or PAS-stained oral scrapings strongly supports the diagnosis. Culture of Candida species from oral scrapings is not generally required, and as Candida may be part of the normal flora of the oral cavity, positive cultures may not represent true infection. Generally, oral Candida infection should initially be treated with topical agents (Box 3). Nystatin suspension or clotrimazole troches are generally effective therapy. If infection occurs in a denture wearer, the dentures must be removed. Once the infection is cured, proper dental hygiene is important to prevent recurrence. Topical antifungal creams will treat angular cheilitis. If topical therapy fails, or in those with severe infection, systemic therapy may be used. In patients with advanced HIV infection, itraconazole doses may require adjustment because of achlorhydria and impaired absorption. Treatment failure should prompt a search for other causes, such as bacterial infection or malignancy. In those infected with HIV or with other immune deficits, frequent recurrences are common, and maintenance therapy may be necessary. Daily treatment with topical antifungal agents or fluconazole, 50-100 mg daily, every other day, or once weekly may prevent recurrence. Maintenance therapy with fluconazole should be avoided if possible because of concerns for the emergence of resistant fungal strains.